It's been a while since I've done a wash day post. This wasn't by accident but on purpose. I decided to limit the number of wash day posts I do in 2016. I made this decision for three reasons: 1) my blog is heavy with wash day posts and I want my blog content to vary; 2) my wash days are similar week after week which makes a boring wash day post; 3) taking pictures of my hair is cumbersome since my best camera is my iPad. So why a wash day post now? 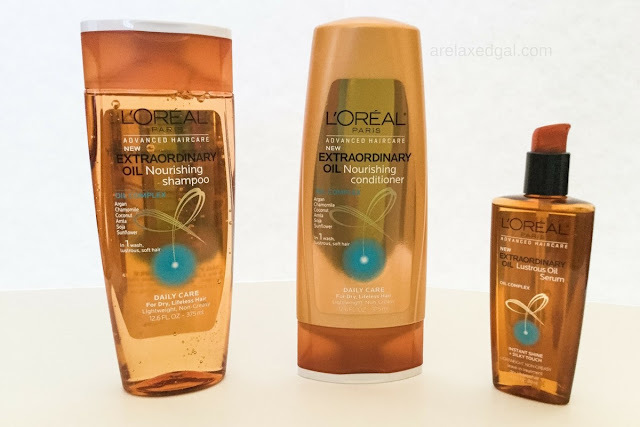 I tried a new hair care collection - the L'Oreal Extraordinary Oil Shampoo System. It contains a Shampoo, Conditioner, and Serum. I received the L'Oreal Extraordinary Oil Nourishing Shampoo System free from Influenster and L'Oreal Paris for testing purposes. 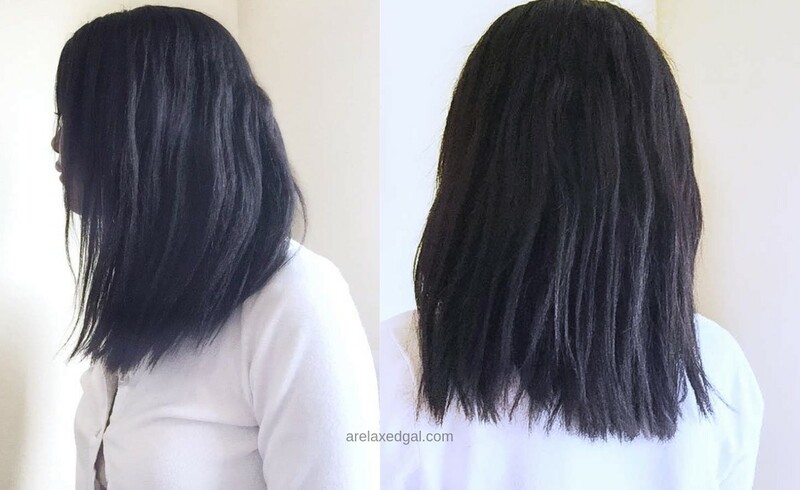 I wanted to share my experience with the products and whether my relaxed hair liked it or not. The L'Oreal Extraordinary Oil Shampoo System claims to eliminate dryness with one wash. The products include argan, chamomile, coconut, amla, soja and sunflower oils. The shampoo isn't a sulfate-free which made me a little nervous. I can't remember the last time I used a shampoo with sulfates. Nevertheless, this Shampoo System came at a great time since I've been wearing my hair out more so it feels dry more often. Will the L'Oreal Extraordinary Oil Shampoo System live up to its claim? For this, I used my staple deep conditioner Eden BodyWorks Jojoba Monoi Deep Conditioner. My plan was to leave the deep conditioner on for about 30 minutes. I got distracted and left it on for over an hour. As usual, my hair felt good after the deep conditioner. 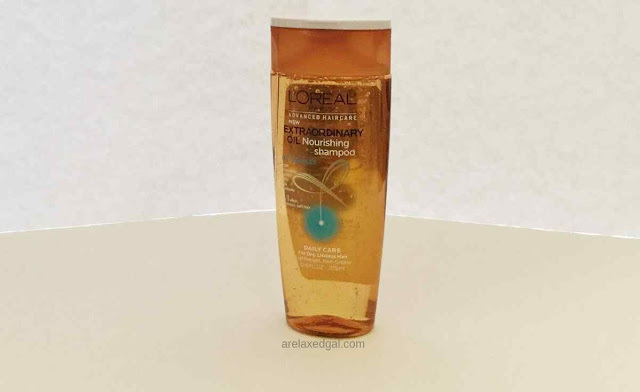 My shampoo this week was the L'Oreal Extraordinary Oil Nourishing Shampoo. As I mentioned above this is a sulfate shampoo. So I made extra special care to only use the shampoo on my scalp and not the rest of my hair. When I rinsed out the shampoo I let the suds run down my relaxed strands. I only cleansed once and to my surprise, my hair didn't feel dry, stripped or stiff. It felt as good or better than it does when I use sulfate-free shampoos. My hair rinse was part green tea, part filtered water and four drops of tea tree oil concoction. I didn't use apple cider vinegar this time around. I thought it might be overkill with the sulfate shampoo. I massaged the rinse into my scalp and left it in during the next step - conditioning. Now it was time for another product from the Extraordinary Oil System. This time it was the L'Oreal Extraordinary Oil Nourishing Conditioner. Sometimes rinse out conditioners don't do anything for my hair. This one could be one of them. So far I'm not impressed. My hair didn't feel dry, but it didn't feel any more moisturized. I finished up by wrapping my hair in a t-shirt and leaving it that way for about an hour. While my hair was still wet I applied Cantu Shea Butter Leave-in Conditioner then sealed with L'Oreal Extraordinary Oil Lustrous Oil Serum. I let my hair air dry overnight. In the morning the hair in the middle of my head was still very wet. So I used my blow dryer to get rid of most of the water before heading to church. My hair felt soft, decently moisturized, was smooth and smelled great! My hair did dry out during the week and I ended up co-washing my ends because my moisturizer wasn't cutting it. I can't say that was a result of the L'Oreal Shampoo System, but more likely a combination of me wearing my hair almost every day and putting my leave in on wet instead of slightly damp hair. I'm going to use the L'Oreal Extraordinary Oil shampoo, conditioner, and serum during my next wash day and see if the results are the same. Hoping the results are even better. Have you tried the L'Oreal Extraordinary Oil Shampoo, Conditioner or Serum? Your hair is so thick and beautiful... Making me realise I definitely need to cut mine and soon... I haven't tried this line but I do love the L'Oreal Elvive full Restore Conditioner for pre-pooing. My hair is always left so soft and manageable. Thanks DeOnne! I haven't heard about the Elvive Full Restore Conditioner. What are its key ingredients? I haven't tried this line either but I loved the Total Repair conditioner! I like the Total Repair Conditioner also. I was actually thinking I ought to purchase again. Thanks for reading! Great review, I too love the total repair conditioner. I would love to try the total repair conditioner. I like the hair. 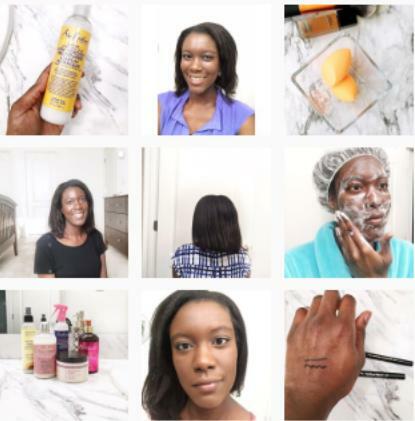 How do you feel about the dove intensive care line or the repair line for over processed hair? Hi Jade! I haven't tried any of Dove's hair products, so I can't say. If the repair line you're referring to is L'Oreal's I've tried the mask and rinse out conditioner. I liked both, but felt I didn't get my moneys worth for the mask. The jar only lasted me about three washes.